We manufacture Floor Kneading Machine with extruder AlsoDough Kneader are mostly know as dough maker, dougk mixer, commercial dough maker, dough kneading machine, kitchenaid dough making machines, flour kneading machines, dough blenders, atta kneader, wheat dough maker. Dough kneaders, specially designed for heavy duty mixing in the catering units and restaurants. The kneader is manufactured using stainless steel with rotating arms. Our dough kneader takes lesser time and gives better water absorption and also folds and stretches the dough for aeration and fermentation. A specialized stainless steel scraper is provided with the dough kneader. The dough kneader makes mixing of the dough easier for preparing chapattis, puris, namkeens, samosa, partha, pizza, etc. Dough Kneader are mostly know as dough maker, dougk mixer, commercial dough maker, dough kneading machine, kitchenaid dough making machines, flour kneading machines, dough blenders, atta kneader, wheat dough maker. We manufacture Papad Making Automatic Machine with Mixer (Floor Kneading Machine) with extruder. This Dough Kneader with extruder would consist of heavy-duty stainless steel body with multi-purpose arms. Heavy-duty mixers are provided to take the full load and to avoid damage to the mixer arms. 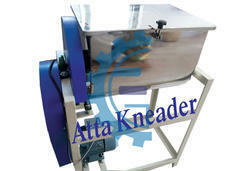 Papad dough kneading / atta mixing machine with tilt able tank & extruder unit for semi sheet are available in Models 20kg. per batch. Looking for Dough Atta Kneader ?